Alice io's Blog - io design & illustration, inc. Welcome to Alice io's blog. This is her place to share on-the-job wisdom, post solutions to problems encountered and ponder questions related to design. adapted to electronic publishing formats! 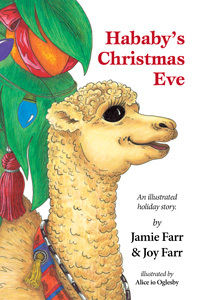 In fall of 2012, two electronic versions of Hababy’s Christmas Eve: An illustrated holiday story were created. The first, a standard fixed layout eBook and the second an enhanced version for iBooks including a full audio recording for a read-to-me option when viewing the book. Yes, read by author Jamie Farr, who best known for portraying Klinger on the hit television show M*A*S*H. His reading is of course wonderfully expressive and is accompanied by original music by Tim Clott. We worked with eBook partnership for file conversion and distribution and their expertise was invaluable! Adjusting layout, page sizing and creating a base file was handled on our end, as well as preparing the audio track with page breaks. Knowing exactly what was needed, that is the trick, and having a knowledgable partner in that process made for a positive experience. This week I learned that yes, there is a limit to the dimensional size of a file created in Adobe Illustrator. 227.54 inches to be exact. No idea why as with vector artwork the file MB size wouldn’t have been especially large. PROBLEM: I needed to provide a design that was 606 inches long to the printer full size at 150 dpi. What I was designing was banners to go along the front of court side scorers tables for the Southern Conference basketball championships. Since the design included a gradated background the printer wanted the file as one continuous piece, rather then breaking it into smaller banners. SOLUTION: The printer’s second choice was a file at 1/2 scale at 300 dpi, but unfortunately that was still larger then the Illustrator limit. So I gave them 1/4 scale at 600 dpi. First time I have not been able to give a printer their preferred file size/format.